New Bob Bartlett biography is released! In 1914, Captain Robert Abram Bartlett trekked 700 miles across the frozen Arctic Ocean to save survivors of the sunken Karluk. The episode was one of many that contributed to the Bartlett myth but, beyond his celebrity, Bartlett was a complex man who struggled to find peace. 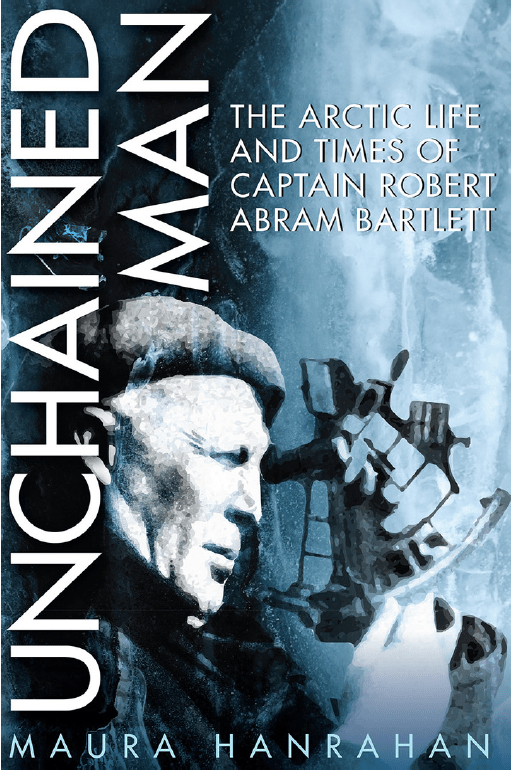 Based on extensive research by the University of Lethbridge’s Dr. Maura Hanrahan, her book Unchained Man: The Arctic Life and Times of Captain Robert Abram Bartlett explores Bartlett’s pivotal role in Arctic history. Hanrahan is a Tier II Board of Governors Research Chair in the Department of Geography and has worked on Indigenous land claims and studied water security in Northern Canada. Her work on the Arctic has been published in encyclopedias and in journals such as Polar Geography She has been an invited speaker on Arctic topics in Norway and Estonia. This is her 12th book. Hanrahan’s interest in the Arctic grew out of her time in Coastal Labrador. Hanrahan is launching her book on Saturday, June 23, 2 to 4 p.m. at Chapters Bookstore, Lethbridge, Alberta. There will be refreshments, a short reading, author signings, and a book draw. Maura Hanrahan has written a fine book about one of Newfoundland’s most famous seamen and arctic explorers, Bob Bartlett. In Unchained Man—meticulously researched and finely written—she has come closer than any writer yet to solving the enigma of the great Bob Bartlett. From the haunting sinking of the Karluk to the epic struggle to reach the North Pole with Admiral Peary, Hanrahan depicts Bartlett as a flawed but extraordinary human being. This book is unforgettable, a must read for lovers of the literature of exploration and the still uncharted region of the Arctic. A riveting, comprehensive portrait of one of the most dynamic and enigmatic sea captains the Arctic has ever seen. Robert Abram Bartlett was larger than life, his adventures the stuff of legends. Maura Hanrahan expertly recounts the long overdue, very true story of this understated polar hero in engaging dramatic prose. This entry was tagged Arctic, Arctic books, Arctic expeditions, Arctic exploration, Arctic explorers, Arctic history, Captain Bob Bartlett, Newfoundland, Newfoundland and Labrador, University of Lethbridge. Bookmark the permalink.